Auto Adjust Body Measuring Tape. Available in: White. Minimum Quantity: 50. Wrist Strap With Uv Meter. Available in: White, Black, Red, Orange, Blue. Minimum Quantity: 50. The widespread consciousness about the well-being and perks of keeping oneself fit has made more and more people to hit the gym and use fitness accessories. The target audience for any business comprises of; a huge chunk of people who are fitness conscious. 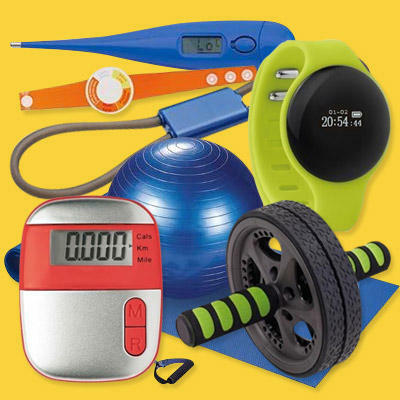 At Mindvision, we have a wide variety of products relating to fitness such as reflexology gloves & socks set, Pedometers, Yoga mats, thermometers, activity trackers, cold packs filled with non-toxic liquids and much more. The products are available in different colors and are of Premium quality that will last for a long period of time allowing your brand to establish reputation and recognition in the market even if your business is not related to Medicare.